Aireon environments and satellites diagram. Credit: Aireon. On January 14th of this year, a SpaceX Falcon 9 rocket, launched the first 10 satellites of the Iridium Next satellite constellation. This coming Sunday another SpaceX Falcon 9 rocket is scheduled to launch, with the next 10 satellites in the constellation to be deployed. When the constellation is completed in 2018, there will be 66 cross-linked operational satellites along with 9 in-orbit spares and another 6 on the ground for future replenishment. On board each satellite is an Automatic Dependent Surveillance-Broadcast, ADS-B, sensor owned by Aireon, a joint venture between Iridium Communications, NAV Canada, Enav, the Italian Air Navigation Service Provider, IAA, the Irish Aviation Authority, and Naviair of Denmark, Greenland and the Faroe Islands. The new ADS-B sensors on each satellite will enable real-time flight tracking, and for the first time, cover the world’s oceans and remote areas. This global coverage will cover the 70% of the world’s Flight Information Regions (FIR) that are currently uncovered by any real-time surveillance. 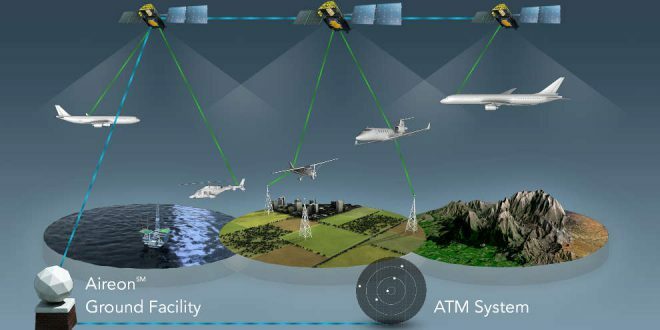 NAV Canada will be the majority stakeholder in Aireon, having a 51% interest in the company after making its final payment later this year according to Ron Singer, National Media Manager for NAV Canada. NAV Canada’s total investment will be $150 million U.S. In March, NAV Canada took full control of the first ADS-B payload hosted on an Iridium NEXT satellite and conducted the first in a series of successful flight tests ahead of the full-system going operational in 2018 after the rest of the Iridium Next satellites have been launched. Ahead of this Sunday’s scheduled launch, Aireon CEO Don Thoma participated in a media briefing this morning. Below, in our Short Take Episode 4 audio segment, are his comments on the progress Aireon has been making.